I've been rewatching some of the plot important episodes again, and I feel like Gin should have already found out about Conan. As far as we know, Gin is the most dangerous and cunning member in the Black Organization that isn't a double agent. Its possible he might even be smarter than the boss, since they've stated that the boss is the type of person who might ruin a plan by over thinking it. And on nearly every occasion where Conan has faced off against Gin, Gin has beaten him. In Episode 425, Gin finds Conan's wiretap on Kir's shoe and immediately changes target to Mouri Kogoro. But before he tries to shoot Kogoro, he wants Kogoro to explain why the wiretap is the same one that was used by Sherry (who he thinks planted it in his car). That's when Conan kicks the soccer ball into the window glass and immediately explains that Kogoro is listening to the horse races on his earphones rather than listening to any sort of wiretap. Then Gin orders them to kill Kogoro and the kid, obviously seeing through Conan's plan to try and remove any suspicions. If Akai hadn't sniped at Gin, then Conan and Kogoro would have died for sure. Now, what I'm wondering is how Gin hasn't put two and two together yet. The wiretap used in Episodes 176 and 425 are the same, and if he notices that much, then he would remember its the same one from 311 as well, which was placed inside Itakura's CD. 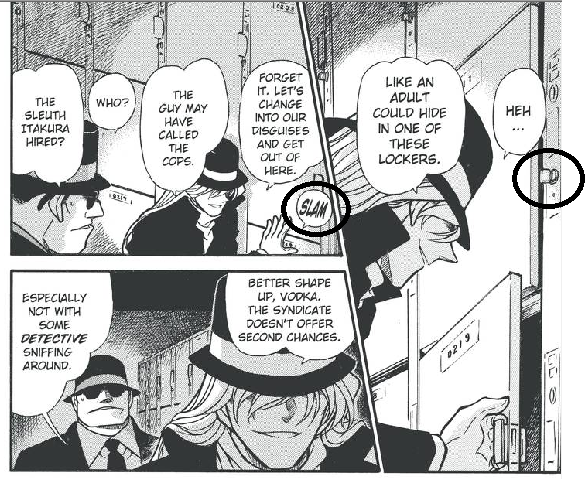 Gin was sure that somebody was hiding in the locker room waiting to collect the evidence, so much that he even started opening the lockers even though an adult couldn't hide in there. When he saw Conan kick the soccer ball at Kogoro's window and explain that he was listening to the horse races, shouldn't that have been a red flag for Gin? All of a sudden a child shows up to coincidentally ruin his plans. Shouldn't he have realized that it could have been a child who put the wiretap in Itakura's CD and tried to trap Vodka? And then hid from them in the lockers? Then in Chapter 700, Gin tells Vodka that all these incidents keep happening in Haido and Beika and that it can't be a coincidence. So far, the only person in that area who has been suspicious to him was Mouri Kogoro, so at the very least he should be sending people there to monitor him. I can understand why he retreated the first time when Akai had the upper hand on the roof, but he could have gone after Kogoro at any point in time after that. As for why he hasn't, it just doesn't make much sense. Gin is the only one aside from Yusaku who has directly beaten Conan. So it doesn't make sense for possibly the second smartest character we've seen so far to make such a big mistake like this. Re: Shouldn't Gin have already found out about Conan? Whiskey wrote: I've been rewatching some of the plot important episodes again, and I feel like Gin should have already found out about Conan. Well, chances are that he most likely already did but he may be intentionally hiding that fact for whatever reason unknown. "At one point while searching for the "clever fox" who set them up, Gin begins opening child size lockers on a whim. He just stops at the one Conan was hiding in and chides himself for doing so because there was no way an adult could hide in those lockers." Also, if he heard Shiho breathing heavily in the fireplace, surely he should have also heard Shin'ichi breathing heavily in the locker? yourereadingthis wrote: Also, if he heard Shiho breathing heavily in the fireplace, surely he should have also heard Shin'ichi breathing heavily in the locker? Not quite the same. Shiho was breathing heavily because she was climbing up the fireplace. Shinichi ran out of breath likely because he was nervous and held his breath while Gin was opening the lockers. He might not have heard him.